How Were Germans Treated In Milwaukee During The World Wars? This photograph was taken in 1943 near the intersection of N. Plankinton Ave. and W. Wisconsin Ave. in downtown Milwaukee. Wisconsin boasts one of the largest German populations in the country, and in the early 1900s, Milwaukee was considered one of the most German cities in America. "Milwaukee was known as the Midwest Munich," Steve Schaffer says. "It was, ya know, a German town." This week’s Bubbler Talk question comes from listener Bruce Campbell, who wanted to know: How were Germans treated in Milwaukee during World War II? "Milwaukee was known as the Midwest Munich." Schaffer, Milwaukee County Historical Society's assistant archivist, estimates that in the 1940s, Germans were at least 40 to 50 percent of the city’s population. Many of them were second or third generation, without a lot of ties to the old country. And as we mentioned in the last Bubbler Talk, at the time of World War II, Milwaukee had already established itself as the center for so-called “Sewer Socialism.” So the Nazi’s fascist beliefs didn’t really appeal to a lot of residents, German or otherwise. "While there were some Germans that were motivated by the fascist message of Hitler, there were just as many Germans and other groups that rejected it," says Schaffer. 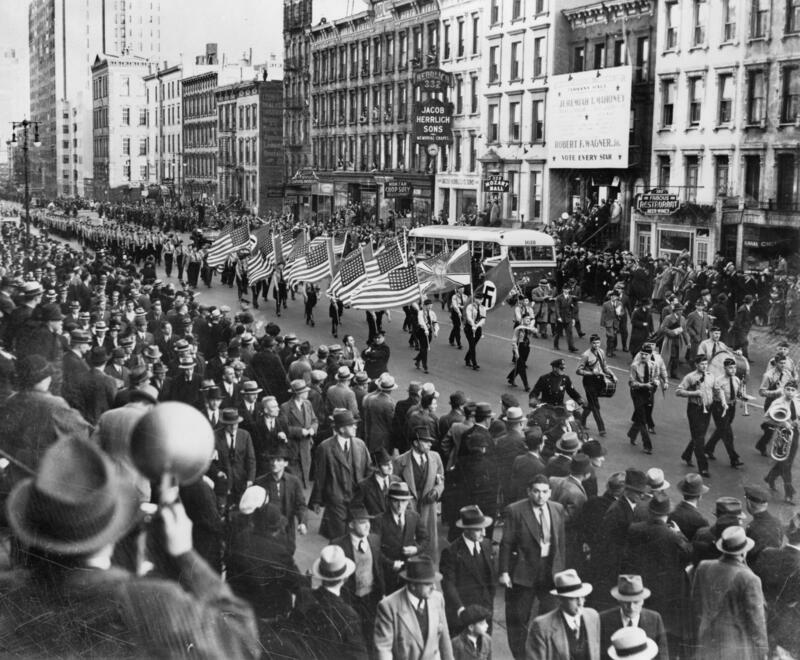 The Bund, marching through New York City in 1939. Like other parts of the U.S., there were some Nazi sympathizers. The Volksbund, also known as the “Friends of New Germany," was a Nazi Group who would meet in Milwaukee, and even formed a base in Grafton called “Camp Hindenberg.” But it was largely made-up of recent immigrants, and most Germans in Milwaukee really considered themselves Americans. According to Schaffer, "In World War II, they were definitely Americans, not Germans. There was no fifth column among the Germans who would support Nazis at all." So unlike Japanese Americans, who faced a great deal of persecution during World War II, German-Americans did not face a lot of prejudice in Milwaukee. Extended conversation with Steven Schaffer from the Milwaukee County Historical Society. World War I, however, was a different story. By the early 1900s, Milwaukee was already considered a very German city. There were German-language newspapers and magazines. There were entire neighborhoods where people just spoke German, and that heritage was even reflected in the styles of architecture that dominated the city. "First generation German immigrants, males 16 and up, were given ID cards. They were not allowed to go in certain areas of the city where it was considered sensitive for war production." Milwaukeeans were proud of their German roots - and while many of them opposed entering the Great War, a lot of people sympathized with the German war effort. "Even until 1916, 1917, you’ll see German-language magazines and newspapers in Milwaukee that are kind of portraying the German side, the Central Power side of the war," says Schaffer. "And there will be relief funds and organizations that will, you know, send relief to war widows and things like that." The United States didn’t actually join the war until 1918, but even before that the U.S. government became concerned about the loyalty of German-Americans. Milwaukee’s local government started to monitor the community starting in 1917. "They were issued identification cards, and first generation German immigrants, males 16 and up, were given ID cards. They were not allowed to go in certain areas of the city where it was considered sensitive for war production. And then that restriction was applied to women, in 1918," he says. WWI Anti-German, propaganda poster, 1917. They were even restricted in the kind of work they could do, and people were in a panic. Suddenly the German community was trying to make itself seem… well, less Germanic. Schaffer says, "The Milwaukee press had like a loyalty patrol in the newspaper. You know, who they thought wasn’t loyal enough. So it was a real sense of hysteria. Buildings were changed, people’s names were changed to become more anglicized. German language was no longer taught in the schools." 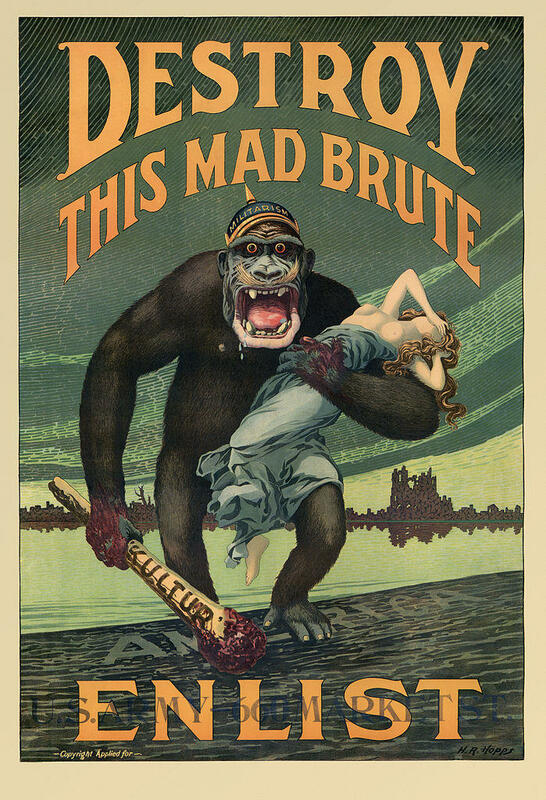 And it wasn’t just German people who opted for a rebranding during World War I, German food was also targeted. Sauerkraut became “liberty cabbage,” frankfurters became “liberty sausage" and some people even credit the term “hot dog” to the backlash against all things German. 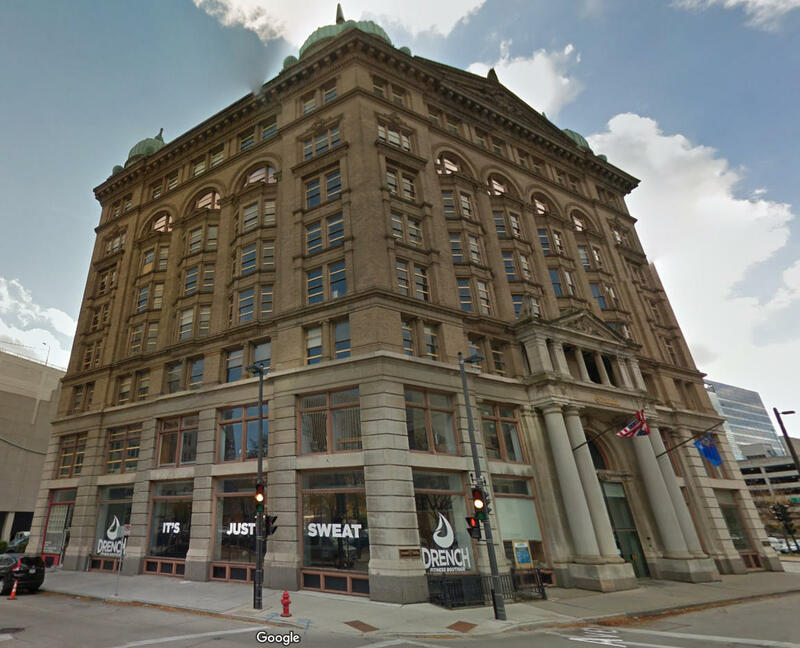 The Germania Building is located at W. Wells St. in downtown Milwaukee. One infamous case of a local building rebrand was the Germania. "The Germania building was renamed the Brumder building and there was a large statue symbolizing Germania," says Schaffer. "That was removed and put away in storage." A lot has changed in Milwaukee since World War I. Today, just one fifth of Milwaukeeans claim some German heritage and “liberty cabbage” is back to being sauerkraut. The Brumder building is once again the Germania, though the whereabouts of the namesake statue? Well, we’ll save that story for another time.Have a question you'd like WUWM to answer? Submit your query below. Europeans have just finished celebrating their 71st Victory in Europe Day. The day marks the official end of World War II in Europe. What you might not know is that it was a significant day for many enemy soldiers in Wisconsin as well. The state held thousands of prisoners of war. Milwaukee County Historical Society assistant archivist Steve Schaffer says there were 36 prison camps in Wisconsin during World War II. In Milwaukee, 3,000 Axis prisoners lived at Camp Billy Mitchell, where Mitchell Airport now stands. Why Do Sidewalks In Milwaukee Have Dates Stamped On Them? It's a question that many of us have probably thought of while we're out for a walk on a beautiful summer evening in Milwaukee. You bend down to tie your shoe, and there, next to your foot, is a date, stamped into the sidewalk like in the picture above. What's The Story With Milwaukee's Police Call Boxes? Even if you’ve spent only a little time in Milwaukee, you’ve likely noticed some unusual figures lurking on city sidewalks. They’re big and blue, dotting street corners across Milwaukee. One sits right outside Kristine Hinrichs’ condo downtown, on the corner of 3rd Street and St. Paul Avenue. “I’ve lived downtown almost 25 years, and they’re everywhere,” Hinrichs remarks.